One unsigned Brisbane band has taken a step closer to realising their musical dreams, as The Lingerers took out the regional semi-final of the worldwide Emergenza competition in Brisbane last week. The band will now have the opportunity to compete in the regional final, hosted by Brisbane’s Hi-Fi Bar. While the international final is still months away, hundreds of bands worldwide have participated in heats, with the hope of reaching the penultimate stage of the competition. Since 1992, Emergenza has given unsigned and emerging bands the opportunity to perform in front of real audiences and judges, an opportunity that has often resulted in widespread attention for the best bands. The competition runs in a battle-of-the-bands format, with heats taking place in major capital cities, before regional and national finals, which determine who will represent their country at the Taubertal Open Air Festival in Germany. In ten years between 1996 and 2006, Emergenza has expanded the competition from Italy and Germany alone to include all of Europe, along with North America, Japan, Australia and soon China. Executive Vice President, Sabrina Baroni, says the expansion allows for a musically and culturally diversified experience. “The idea that musicians from North America, Asia and Europe can compete in a worldwide competition is still something very unique,” Ms Baroni said. A passionate supporter of emerging musical talent, Ms Baroni said it was important for the organisation to provide the best outcomes for the musicians participating. “By running this competition we’re ensuring the next generation of musical talent is not lost…we’d like to see a diverse range of musicians continue to perform, whether that be locally, nationally or internationally,” Ms Baroni said. Previous years have produced winners such as Swedish band Royal Republic and Americans After The Fall. Formed in 2009 by good friends Hadley Perkins, Ben Jackson and Stirling Blacket, The Lingerers have been very vocal in Brisbane’s local music scene lately. In the last year, the band has booked gigs in some of Brisbane’s best live venues, such as Barsoma, The Troubador, the Hi-Fi bar and The Step Inn. Blacket describes the band’s sound as ‘eclectic’, gathering sounds from the progressive rock, alternative, indie and psychedelic rock genres. It’s one quality that the local Brisbane band attributes to their recent success, most of which has stemmed from their recent involvement in Emergenza. The band was at first pessimistic about their chances in the competition, as no members had ever received technical training or played in a band before. But their infectious and unique live sound has seen them progress from the heats with ease. “Obviously we were very surprised…it means quite a lot to be involved in this stage of the competition,” Mr Blacket explains. Mr Blacket agrees the competition is one of the best ways for unsigned bands to get noticed. “The opportunity to play in front of a live crowd of a thousand people is something you don’t often get as an unsigned band,” Mr Blacket says. An important part of Emergenza is uncovering the best local talent from each area, something which Mr Blacket is supportive of. “Competitions like this are where some of the best bands have been signed…they’re an important part of the Australian music scene, which I think is very strong at the moment,” Mr Blacket says. Minister for the Arts and Premier, Anna Bligh, says the continual funding of live entertainment areas such as Fortitude Valley is paying dividends for Brisbane. “The importance of live venues such as Fortitude Valley is significant…they make a huge contribution to Brisbane’s cultural identity,” Ms Bligh said. Mr Blacket believes areas like Fortitude Valley are essential if Australia wants to produce quality musicians in the future. 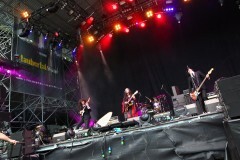 Last year's winners HANATOCHIRURAN playing Taubertal Festival. Photo: Jason Lackie. “We wouldn’t have had the opportunities we’ve had if it wasn’t for places like Barsoma or The Hi-Fi…every night of the week there’s great local bands playing,” Mr Blacket said. Australian Emergenza Manager, Bo Philips, believes the opportunity to play in some of Australia’s most prestigious venues is a great experience for competing bands. “It gives the bands a chance to see what performing in front of a live audience is like,” Mr Philips said. Mr Philips also said he had seen many good Australian bands slip through the cracks due to poor self-promotion, the most important part of succeeding in the music industry. “Certainly there are a lot of good bands out there, but what we want is for bands to be able to promote their own shows and be successful,” Mr Philips said. 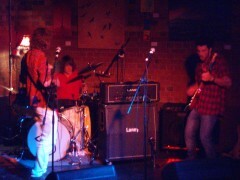 For now, The Lingerers are focused on reaching the international final of Emergenza. “To play in front of a crowd that big, alongside bands like The Prodigy, would be unreal for us as musicians. I can’t imagine a better opportunity,” Mr Blacket said.